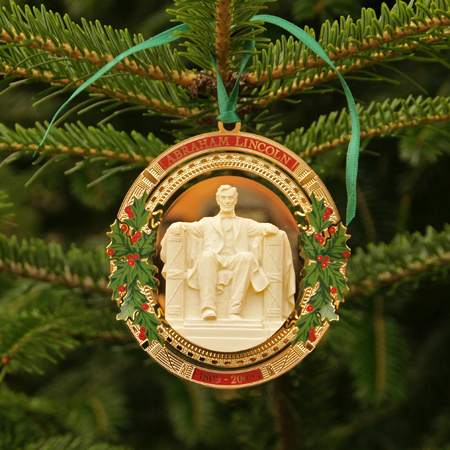 Christmas Ornaments Made in USA - 2009 Secret Service Abraham Lincoln Bicentennial Ornament - A Christmas Ornament Co. This year's Secret Service ornament celebrates the bicentennial birthday of President Abraham Lincoln. Born on February 12, 1809, he became the first Republican president. He successfully led the country through its greatest internal crisis, the American Civil War, preserving the union and ending slavery. On April 14, 1865, John Wilkes Booth assassinated President Lincoln at the Fords Theater. This Christmas Gift Idea can serve as either a handsome Christmas display or a Christmas Tree Ornament. Whether you are looking for a holiday ornament, a tree ornament, or Christmas collectible, this gift will make any Christmas a White Christmas.